Can I handle a New York City co-op board application myself? Absolutely. But having a buyer’s agent guide you through common pitfalls for free would be a much better option. A good buyer’s agent will advise you to type the purchase application and to have a table of contents, page dividers and tabs. A good buyer’s agent will advise you to fill out all questions including ones which are “N/A” for you. A good buyer’s agent will also double check your financial summary against your back up documentation and make sure everything adds up. A good NYC buyer’s agent will review your co-op reference letters to check for quality of content, formatting, style and grammar. The average NYC real estate commission is 100% paid by sellers, which means that the services of a buyer’s agent are free to you. Moreover, you won’t get a better deal by being unrepresented since sellers in NYC typically agree to pay the same total commission even if no buyer’s agent is involved in the deal. All of this advice on the buy side is free to begin with, so why would you turn down the help? In addition to receiving free board package assistance, hiring a buyer’s broker in NYC can also benefit you financially. 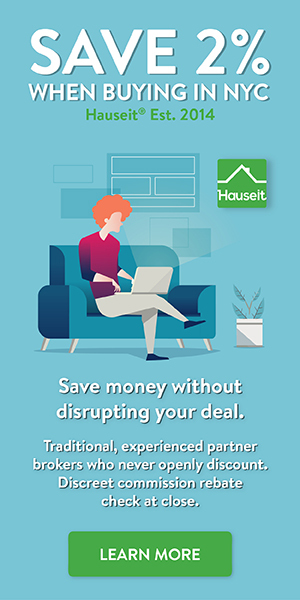 You can save $20,000 or more (and reduce your buyer closing costs) by requesting a discreet NYC broker commission rebate through an independent, highly rated, full service REBNY Member Buyer’s Broker. Buyer broker commission rebates in NYC are completely legal and non-taxable. You can earn a rebate on virtually every listing in the city. Don’t let a listing agent bully you into dual agency so they can earn double commission. Because of the automatic savings on offer, requesting a NYC real estate commission rebate is a no brainer. 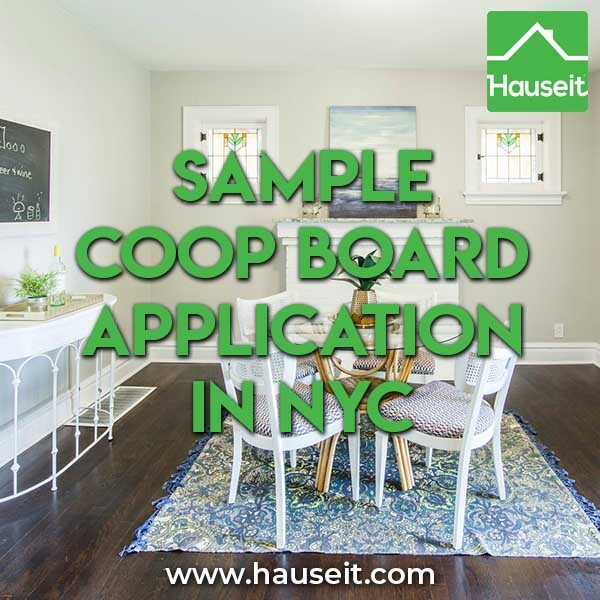 What does a sample NYC coop board application look like? We’ve included a real life, sample coop board application below. Please note that most coop board applications will require multiple copies of all documents, collated and typed. The listing agent will share with you how strict or relaxed the board is in regards to the application. Some co-op boards are relatively benign and won’t even read all of your documentation. Other co-op boards will be extremely nit picky and look unfavorably upon you even for innocent mistakes such as typo’s and grammatical errors. More often than not however, it is simply the listing agent who is the nit picky roadblock to you being able to just submit your coop board application. Sometimes listing agents feel like they have to justify their commission by acting like an investment banking Managing Director checking for typos of a presentation that a new analyst just created. This sort of scrutiny can be infuriating, but remember the reason that you decided to buy a co-op in the first place was because of its superior affordability versus condos! Interviews: Interviews are scheduled at Board’s request. Information Requests: Please mail, e-mail or fax requests in writing. Please include building address and apt. no. and where and to whom this information should be sent. Fees must be received prior to processing request. Offering plans, By-laws, financial statements are not faxed. Arrangements can be made to either pick up documents or have them mailed. Suggestions for expediting the processing of applications: Designate one contact person – Send only a complete application and submit required copies. If an item is missing from the required documents, please indicate in writing a reason for the missing item. Attached is all the information that you need to transfer the shares of your apartment. Please not that we not allow guarantors in the mortgage, that the purchaser must use the apartment as a primary residence and that the maximum financing allowed is 80%. Applicants are usually interviewed within four weeks from the time that a complete application is received by [BUILDING MANAGEMENT COMPANY]. You can usually find out the outcome of the interview the next day from the Closing Department. If you have any questions, please contact the Closing Department at [PHONE]. The Closing Department at [BUILDING MANAGEMENT COMPANY] is located at [ADDRESS]. Please do not contact any Board members.  Reference letter from employer including job duties, salary and date of employment. If self-employed, your letter indicating nature and age of your business, and letter from accountant indicating your expected net income for the current year.  Singed copies of Federal Tax returns for the last two years- complete with all the schedules and W-2 Forms.  Three (3) Personal Reference letters.  Three (3) Business Reference letters.  Letter addressed to 130 East 18th Street Owners Corp. If purchase is to be financed: three original Recognition Agreements must be signed by the bank (Aztech form only). All checks must be certified or cashiers checks made payable to [ADDRESS] Owners Corp. except as indicated. You may combine several checks.  Refundable deposit of $500 to pay for any damage to common areas while moving in. this amount should be in a separate check. The buyer must take out homeowner’s liability insurance and submit proof of such, by providing Certificate of Insurance to the Board of Directors, naming [ADDRESS] Owners Corp. and [BUILDING MANAGEMENT COMPANY] as additionally insured before moving in.  Refundable deposit of $500 to cover any damage to common areas while moving out. This amount should be in a separate check. We realize that this application contains sensitive personal information. We do require a social security number for each applicant on the Consumer Report Release Authorization Form/Credit application in order to obtain a consumer credit report. However, social security numbers may be contained in other documents that are submitted for review. Before submitting these documents, please black out or remove social security numbers on these other documents. Century and the Cooperative/Condominium cannot be responsible for the security of this information if it is included in these documents.  The completed questionnaire and additional documents will be returned via email.  The request and check must be sent together. We cannot receive them separately. Purchasers or those shareholders refinancing an existing mortgage or taking out a home equity loan or line of credit must contact the building’s transfer agent to obtain an application for Board approval. Once a final decision is reached regarding your application, the Board of Directors will notify the Closing Department and we will notify you of their decision. If approved, a closing date may be scheduled; however, no sooner than two weeks after approval. We request that no children under the age of 16 attend the closings. Also, please note that no pets are permitted in the building. If the closing is not consummated and is adjourned, there will be an adjournment charge of $300.00 in addition to the administrative fee. We request 24 hour notice of cancellation for a closing that has been scheduled with our office. If a closing extends beyond the two hour allotted time period, there will be an additional charge of $150.00 per hour. We request that once a closing is scheduled for a specific time and date that all parties make every effort to arrive on time. Maintenance and all other fees and charges due the cooperative corporation must be paid up to date. All checks from the seller must be certified checks, bank checks or money orders. No personal or attorney escrow checks will be accepted from the seller. Move in/out fees and deposits must be certified checks. Please inform your attorney that if a power of attorney is being used, we request that a copy of the completed and signed power be emailed or faxed to the appropriate transfer agent in the closing department prior to the closing date for review and approval. The fax number is [NUMBER]. The original is to be delivered at closing with an affidavit as to the Power of Attorney being in full force. It is important that this information be passed on to the seller’s attorney as well. If the seller has lost the stock certificate and/or proprietary lease, please notify us prior to the closing so that we may obtain lien searches where applicable and prepare an affidavit of lost stock and lease for the seller to sign. No transfer of the stock and lease will be made unless we have either a stock certificate to cancel or a signed affidavit prepared by our office. There is an additional fee of $200.00 for each lost document. If this is an estate transfer, please email or fax us in advance of the closing the requested estate paperwork. Please note that all executors must sign the required transfer documents. If you are buying a foreclosure and this is a foreclosure sale, please ask the foreclosing lender to submit the foreclosure paperwork prior to the closing. Once you have closed on your apartment and after you move in or move out, please notify the Assistant Property Manager who will then process the necessary paperwork for you to receive a refund of your deposit check. Please allow between 35-45 days for this process. If you have any further questions, please call the appropriate transfer agent in the Closing Department at [phone number]. Please answer yes or no to the following questions. If any of the answers are “yes”, please explain on the back of this page or use additional paper. The undersigned applicant(s) certifies that all of the foregoing information is a complete and accurate statement of facts. It is understood that the Board of Directors or its designated representative will rely on the information furnished in considering this application. It is acknowledged and understood that pursuant to authority granted in the Proprietary Lease, the consent of the Board of Directors or its designated representatives to this transfer is required. The undersigned authorizes the Board of Directors or its agents to contact any of the employers, banks, landlords, educational institutions, references, etc. described herein for information bearing upon this application. It is further understood that the Board of Directors or its designated representative may require additional information and may require a personal interview with the applicant(s) and other individuals who will reside in the apartment. It is also understood that in no event will the Corporation, its Board of Directors, or its agents be responsible for expenses or liabilities resulting from any delay in this review; and, further, in no event will the Corporation, its Board of Directors, or its agents be responsible for any liabilities or expenses incurred by an applicant whose application is not approved. The undersigned further acknowledges that, if approved, the undersigned will not, without the prior written consent of the Board of Directors or its designated representatives make structural alterations to the apartment. The undersigned applicant(s) further acknowledges and agrees to be bound by any and all agreements affecting the use and occupancy of the cooperative apartment that is the subject of this application, including, without limitation any alteration, or alteration agreement or other use agreement, if any, heretofore entered into by the prior owner(s) or occupant(s) of said cooperative apartment which would be binding on or adversely affect the applicant(s) and/or the cooperative apartment after the Closing. Furthermore, to the extent that the seller, or its predecessors, was or is obligated to effect repairs resulting from its actions or renovations, I understand that I am now responsible for the same. The undersigned acknowledges that the apartment is being acquired “as is” and that the purchaser of a Cooperative apartment takes possession subject to the provisions of the by-laws of the Corporation and the proprietary lease, when issued, and assumes all of the seller’s obligations thereunder. By signing below, I/we authorize [BUILDING MANAGEMENT COMPANY], and its assigns and successors in interest to use any consumer reporting agency, credit bureau or other investigative agencies employed by such, to investigate the references herein listed in this application or statements or other data obtained from me or from any other person pertaining to my employment history, criminal history, driving history, credit, prior tenancies, character, general reputation, and mode of living, to obtain a consumer report and such other credit information which may result thereby, and to disclose and furnish such information to the owner/agent listed above in support of this application. I have been advised that I have the right, under Section 606B of the Fair Credit Reporting Act, to make a written request, within reasonable time, for a complete and accurate disclosure of the nature and scope of any investigation. The purpose of this search is to verify information on me/us for a lease, sublet or purchase of an apartment, and in the future should I/we default on my/our obligations, I/we also agree to hold [BUILDING MANAGEMENT COMPANY], and its affiliates harmless for any claims that may arise as a result of this investigation. 1) If your application is denied or other adverse action is taken against you due to a screening report the landlord uses, the landlord must tell you so and how to contact the screening company to obtain a free copy of the report. 3) Annually, you may order a free screening report form: www.annualcreditreport.com (in addition to a free report from each national consumer reporting agency if adverse action was taken against you). Please Note: Supporting documentation for all assets and liabilities is to be attached to this statement. Please use the word “none” where no amount is to be entered. The foregoing statements and details pertaining thereto, both printed and written, have been carefully read and the undersigned hereby solemnly declares and certifies that same is a full and correct exhibit of my/our financial condition. Instructions: If the income tax statement you submit with this application is for the prior calendar year, then complete this form for the current calendar year only. If you have not submitted a filed income tax statement for the prior calendar year, please complete two forms; one for the preceding year and one for the current calendar year. *Please note as per the second amendment to the offering plan, a minimal fee of $250.00 is due the Corporation if the computed fee is less than $250.00. Please be advised that I am making the following representations to [CO-OP CORPORATION] in connection with the proposed purchase of the shares and proprietary lease for Apartment _________. 1. I will occupy this apartment as a primary residence. 2. I understand that the policy of the building with regard to subletting is restricted to extraordinary circumstances and governed by the House Rules, which have been received. 3. I do not intend to structurally alter the apartment without the prior permission of the Corporation and I understand that I must submit an Alteration Application to the Managing Agent prior to the commencement of any work. I also understand that no alteration affecting the exterior of the building will be permitted. For minor work, such as painting and floor refinishing, I understand that I must submit a Light Work Application. 4. I acknowledge that I have been informed that the building has a corporate transfer fee, commonly known as a flip tax, which is collected at the time of the resale of the apartment. 5. I understand that financing or refinancing of any type will not be permitted without the consent of the Corporation. 6. I acknowledge that I may not have a clothes washer or dryer in the apartment unless approved by the Corporation. 7. I acknowledge that I may not have a window air-conditioner. 8. I acknowledge that the building does not allow and I may not have pressure assisted toilets. Refundable and non-refundable move-in/move-out fees and deposits for sublease applications are to be submitted with the sublease/lease applications. Move-in/move-out fees and deposits for purchase applications are due and payable at closing.. These fees/deposits are due from both the shareholder/seller who is moving out and the prospective purchaser/subleasee/lessee who is moving in. Checks are to be made payable to the cooperative corporation and must be either CERTIFIED OR MONEY ORDERS. Please note that shareholders who move out prior to submission of an application package or a closing must submit to his/her/their managing agent the move-out fees and deposits required prior to scheduling a move-out date with the superintendent. No refund checks will be issued unlesss you inform our office of your forwarding address. The superintendent will not schedule a moving date unless approval is received from the managing agent. Also note these checks will be deposited upon receipt. All other fee and deposit checks received are deposited upon board approval for a sublet/lease applications and after the closing for a purchase application. Move-in/move-out fees are non-refundable. Move-in/move-out deposits are refundable once it has been confirmed by the building staff that no damage has occurred to the common areas of the building. An inspection of the premises will be made within a reasonable time after your move and if damage has occurred, you will be notified in writing by the managing agent. The cost of repairs will be deducted from your deposit amount and the balance, if any, will be refunded to you. If there is damage which exceeds the amount of your deposit, you will be required to pay the amount of all additional damages within ten (10) days of receipt of notification by the managing agent of the amount due. If there is no damage, the deposit will be refunded in full. Please note that the refund process will take 30 – 45 days since confirmation of no damage must be received and refund checks must be drawn. Also be reminded that you must inform us of your forwarding address if you are moving out of the building. Generally, the scheduling of move-ins and move-outs are between the hours of 9:00 a.m. and 5:00 p.m. Monday through Friday excluding holidays and weekends. All moves must be completed by 5:00 p.m. Some buildings moving hours may vary from this. It is important that you check with the superintendent as to the specific building policy. Please take this into consideration when you make arrangements with moving companies. Also note moving companies employed by residents must be insured. Move-in/move-outs are scheduled with the superintendent only after Board approval is received, all fees due are paid and in the case of a purchase, the closing has taken place. Three (3) days advance notice is to be given to the superintendent. Lead Warning Statement Housing built before 1978 may contain lead-based paint. Lead from paint, paint chips and dust can pose health hazards if not managed properly. Lead exposure is especially harmful to young children and pregnant women. Before renting pre-1978 housing, lessors must disclose the presence of known lead-based paint and/or lead-based paint hazards in the dwelling. Lessees must also receive a federally approved pamphlet on lead poisoning prevention. (i)_________ Known lead-based paint and/or lead-based paint hazards are present in the housing (explain). (ii) ________Lessor has no knowledge of lead-based paint and/or lead-based paint hazard in the housing. (i)_________Lessor has provided the lessee with all available records and reports pertaining to lead-based paint and/or lead-based paint hazards in the housing (list documents below). (ii)________Lessor has no reports or records pertaining to lead-based paint and/or lead-based paint hazards in the housing. Agent has informed the lessor of the lessor’s obligations under 42 U. S. C. 4852d and is aware of his/her responsibility to ensure compliance. Lessee has received copies of all information listed above. Lessee has received the pamphlet Protect Your Family from Lead in Your Home. The above parties have reviewed the information herein and certify, to the best of their knowledge, that the information they have provided is true and accurate.  The Board of Directors has approved my application.  I have paid all required move-in fees and deposits and have scheduled a move-in date with the superintendent. It is not necessary to return copies of the house rules and lead information brochure with the application package. The management of [BUILDING], comprised of the Board of Directors, Century Management and the Resident Manager, is committed to the health, safety and welfare of the shareholders and tenants of [BUILDING]. In an effort to educate and better prepare our shareholders in the event of an emergency, Management has created this Emergency Preparedness Guide. This Guide is a means to help educate, enable and empower our shareholders to plan ahead and be better equipped in the event of an emergency or disaster. More importantly, we hope this Guide furthers the dialogue in your own household about emergency preparedness. Some items discussed herein may be viewed as self-evident or stating the obvious; however, Management has prepared this Guide to speak to the various demographics represented here at [BUILDING], especially those who might not have previously experienced emergency situations in the New York City area. While living in New York City may feel isolating at times, Management views our building very differently. Most recently, we witnessed our staff and shareholders rise to the challenge during Hurricane Sandy. We, as Board members and fellow shareholders, wish to continue and encourage the “know and help thy neighbor” spirit amongst us and the community-at-large. Please familiarize yourself with this Guide and keep it in a safe place for future reference. Management is concurrently evaluating the building’s own internal protocols and safety procedures to maintain the co-op’s building systems. As those plans are finalized, any relevant information that might impact shareholders will be distributed to you. Should you have any questions, please feel free to contact any of us. It is impossible to fully anticipate and list all the possible emergencies that could occur. As such, this Guide is not meant to be fully comprehensive but rather to highlight and have shareholders think through various scenarios to be better prepared should such an emergency occur. According to the New York City Office of Emergency Management, the categories listed below generally reflect the types of potential hazards that may occur in the New York City area. To that list, we have also added the types of emergencies that may be limited to our building or an individual shareholder’s apartment but constitute an emergency nonetheless. As much as we can hope to anticipate and prepare for any crisis, in many instances these events may be unforeseeable. As such, we hope you will consider the above-mentioned scenarios and consider your own plan of action. It is important to develop and practice an emergency plan with your household members (including children) to prepare for what to do, how to find each other and how to communicate in an emergency. Management and the building staff have been and are continuing to evaluate their own emergency policies and procedures and are in the process of updating the building’s plan that includes steps that the staff will take to protect the building and, to the extent possible, ensure the continued (or resumed) operation of critical building equipment. Relevant information from that plan is summarized below. 1. The Resident Manager – In the event of an emergency, the Resident Manager is the primary person in charge. In consultation with Board members and the Managing Agent, he determines the actions to be taken to protect the building’s equipment and its shareholders. The Resident Manager is also the primary coordinator of building systems plans/actions with the Managing Agent and key Board members. 2. Other Building Staff – Other building staff members will support the efforts of the Resident Manager. Their primary responsibilities will be to ensure the safety of the building and, where possible, assist shareholders during an emergency. 4. In the event of a power outage, the staff will promptly close the laundry room, compactor rooms on each floor, and one stairwell (in order to centralize and maintain safety lighting for all 17 floors). Depending on the nature and duration of the emergency, shareholders may be asked to hold on to their garbage or to bring it downstairs themselves. 5. Notices will be posted as soon as practicable. Shareholders may also receive broadcast telephone messages, email or text alerts via Building Link (see below). a. Participate with fellow EFCs in periodic meetings during an emergency to receive and share information about the current status of the building and any relevant plans that may impact shareholders; b. Share such information with the shareholders on their assigned floor(s); c. Assist or troubleshoot issues for shareholders on their assigned floor(s) that might arise during an emergency; d. Assist building staff as needed; and e. Provide feedback and information to Management regarding needs and the physical conditions of the floor(s) to which they are assigned. 2. A designated Volunteer Network Coordinator(s) will oversee and manage all the operational logistics among all the EFCs during an imminent or, if possible, unforeseeable crisis. 1. Central Information Board – There will be a central information board in the lobby area where current information about the emergency situation will be posted and updated as soon as practicable. Shareholders are also encouraged to use this information board to post notices of any neighborhood or building-related information that could help fellow shareholders. 2. Building Link – Through this technology (details to be provided shortly), the Board and Managing Agent will be able to transmit broadcast telephone, text and email messages to all shareholders using the Building Link system. Shareholders are strongly encouraged to sign up and provide their personal contact information in order to receive building-wide communications. 3. Emergency Floor Coordinators – As stated above, during an emergency, the EFCs will meet periodically to receive information that will be disseminated by them to each of their assigned floors. Management may seek to enlist other shareholders to volunteer their services on an ad hoc basis during an emergency situation. Examples of where shareholders can help include: helping staff with managing the garbage; carrying packages up and down stairs for fellow shareholders; and accompanying delivery people to shareholder apartments. The Board encourages the EFCs to coordinate with fellow shareholders in this regard. A. Emergency Contact Information and Keys. It is extremely important that Management has your emergency contact information and apartment keys in case of emergency. 1. Shareholders should record their contact information in Building Link – [BUILDING] has recently subscribed to Building Link, a secure website that, among other things, helps to capture and store emergency contact information. Management will soon be distributing information on how to sign up online. Having your contact information recorded on that site will enable Management to contact you if there is an emergency in the building or in your apartment, particularly if you are not on the premises. Examples of such emergencies include smoke alarm, fire, water leaks, etc. Furthermore, in the event of a full or partial building evacuation, it will allow Management to alert you to the status of the building and your apartment. 2. Relative/friend information – Shareholders should also provide the name and contact information for a relative or close friend who can be contacted in case you cannot be reached in the event of an emergency. This information is also needed in case you become ill and family must be informed. 3. Apartment keys must be left in KeySure. KeySure is a system in which you seal your keys in a box provided by the Resident Manager. The box is assigned a random number (not your apartment number) and only the Resident Manager has access to the KeySure boxes and the code to identify your individual key box. A variety of emergency situations may arise in which the Resident Manager or staff must legally enter your apartment (e.g., smoke alarm, small fires, water leak). If he does not have access to your keys, he may be required to open the door by force which may result in more damage to your apartment or that of your neighbor(s) due to the delay in accessing the apartment. It should also be noted that shareholders are responsible for any damage resulting from the necessary forced entry into an apartment. B. Shareholder Procedures for Personal/Apartment Emergencies. 1. Determine the emergency. If the emergency is life-threatening, call 911 immediately. 2. Call the front desk to notify the Resident Manager or any staff member as soon as possible. 3. For non-life threatening emergencies (e.g., water leaks, etc. ), the Front Desk is the primary point of contact. 4. Building staff will notify Management to help assess the emergency. C. Staying in your apartment during an emergency. 1. In the event the emergency is foreseeable and there is time to prepare, we remind shareholders to notify and coordinate with any outside service providers regarding alternate arrangements. For example, if a shareholder relies on food deliveries, has a home health aide, or routinely gets picked up by an ambulette, it is best to confirm ahead of time if these services will be available during an emergency. If such services are not available, make sure alternate arrangements are made. 2. Each shareholder is strongly advised to have certain supplies on hand. Shareholders should not assume that neighbors and building staff are available at a moment’s notice. If you need assistance with making your personal emergency plans, please speak to Management, staff or your assigned EFC. 4. In the event of a power outage, you may be asked to go to the lobby to meet your guests or pick up anticipated deliveries or packages. As security cameras might not be available and staffing resources may be limited, the staff will be instructed to take heightened safety precautions for the entire building and not permit unaccompanied visitors or delivery people into the building. D. Evacuating your apartment during an emergency. In the event of a life-threatening situation or prolonged emergency, shareholders either may voluntarily decide or be required to evacuate their apartments. During a mandatory evacuation, Management recommends shareholders stay with friends or family outside the evacuated areas until the problem has been resolved and it is safe to return. We also recommend designating an out-of-state contact who all family members can call if separated during the emergency. a. If a fire breaks out in your apartment, remain calm and get everyone out as soon as possible and close (do not lock) the door behind you. b. Do not use the elevator. Take the stairs. c. Call 911 from a safe place and alert the Front Desk or staff immediately. d. If the fire is not in your apartment, stay inside and listen for instructions from firefighters unless conditions become dangerous. Open windows a few inches at top and bottom unless flames and smoke are coming from below. e. Always feel doors with the back of your hand before you open them. If they are hot, try to find another way out or stay where you are and await further instructions. f. If you are unable to get out for any reason, stay near a window. Close the door and fill cracks with wet cloth to block out smoke. g. Familiarize yourself with the location of the stairwells in relation to your apartment. In the event of low visibility due to heavy smoke/fire, it is important that you can identify the appropriate doorway. a. If there is time, secure your home. Close and lock windows and doors, turn off all electric lights and unplug appliances before you leave. Make sure all water faucets are shut. b. Wear sturdy shoes and comfortable, protective clothing. c. Do not use an elevator during building or area-wide emergencies unless directed to do so by emergency officials. d. Take your “Go Bag” (see above). 3. Meeting Site – In the event a mandatory evacuation is limited to [BUILDING] or its immediate vicinity, Management has designated the intersection of Gramercy Park South and Irving Place as the emergency meeting site for all shareholders and building staff. Please inform your children and members of your household of this location should family members become separated. 4. Pets – Management reminds pet owners to think about where you will go with your pet and how you will get there if you have to leave home during an emergency. Copies of the “Ready New York – Pets” brochure are available at the Front Desk. a. Arrange for family or friends outside of the affected area to shelter your pet. b. Identify animal-friendly hotels outside of the affected area. c. Speak with your veterinarian, kennel, or grooming facility to see if they can offer shelter for your pet during an emergency. d. Have a Go Bag for your pet (see above). Management will periodically review and, as necessary or appropriate, revise or update the Guide to ensure its continuing relevance and effectiveness. Emergency preparedness is very important to us and we will continue to seek ways to improve and enhance our existing policies and procedures. The Shareholders will be notified of any changes and/or provided with any updated Guides, as appropriate.